I'm pretty angry now. This probably has to do with the fact that I have to wake up so early to be able to report on this event, but I can not imagine Darren Till making such a crucial decision about Stephen Thompson. I had won Thompson four of the five rounds and lost only the fifth because he was dropped. Wonderboy fought his fight, and Till hesitated over and over again. But somehow Till got two 49-46 and a 48-47. I do not understand that. The laps were no wonder for Wonderboy, but I thought he had landed the cleaner shots during the first 20 minutes, and Till seemed a bit violent. When they announced the results, I wrote: "Stephen Thomson defeated Darren Till" before even lifting an arm because that's the same as what I saw. Unless they said the other guy's name. And raised his hand. What? 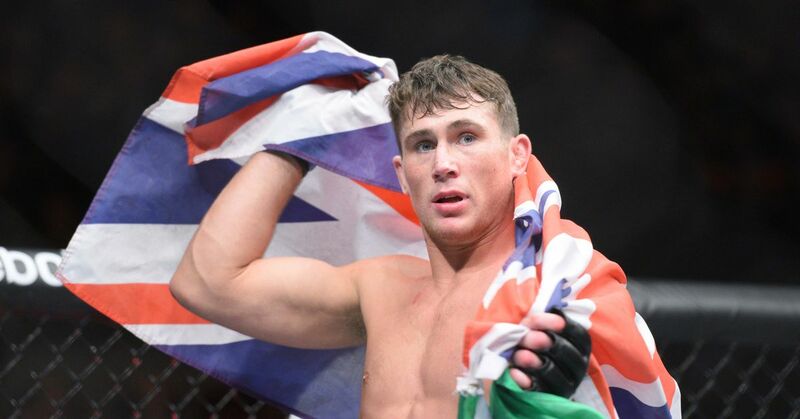 Look, I like Darren Till. I thought he was fighting well. But he did not win this fight. He did not win this fight at all, and I feel bad for Stephen Thompson now. He took a man in the ranking on the road. He was in a difficult position. And he was robbed by the judges tonight. Yes, I used the R-word. I think it applies here. Neil Magny managed to stay on the map by getting an ultra late substitute in Craig White. White fought for a few minutes, but Magny's experience was too much. He caught him with a hard knee on the face, dropped him and pounded him out. After the fight, he called Kamaru Usman out, but it might be too late for that now. What a comeback of Arnold Allen. Mads Burnell was the biggest part of the fight over him. Then Allen grabbed out of nowhere and grabbed the faucet. He took the time after the fight to call his father as a longtime steroid user, but says he is clean as a whistle. OK? Makwan Amirkhani and Jason Knight talked a lot, then they went out and fought for five whole minutes. Amirkhani dropped Knight. Knight dropped Amirkhani twice in a row and had put him in serious danger, then he ended up in rubber protection? That was really strange. Amirkhani controlled him only for the next two rounds on the mat and stole a victory from the fists of defeat. The judge who gave Knight a 30-27 score? He or she should not judge UFC fights. Amirkhani's interview was just strange. He told a story that he went to Chechnya with Jimi Manuwa (who was in the crowd) and said that Manuwa is the craziest type in the world because he wears a gold cross in a Muslim country. That was embarrassing. Claudio Silva and Nordine Taleb mixed it well, then Taleb came to the side. Taleb was in control, but fell for a leg loop (is it just me or is that a lot of Tristar guys lately?) And Silva took advantage of them. Silva was definitely crushed and finished with a face-crank / jaw crusher. Silva also had one of the weird post-fight interviews lately, branding a British Zilian and asking Dana for the "50 Keys" bonus. What? Eric Spicely looked surprisingly good as Darren Stewart stood for one and a half rounds on his feet, but it was not like he would come up with his grappling game as if he would eventually get caught. And he did. Tom Breese looked good with his size advantage over Daniel Kelly, injured him and stopped him in the first round. Kelly thought it was a feast for the eyes, but it looked like a legal blow was coming to me. It seems that the love affair with Kelly could be over after three direct defeats. Lina Lansberg against Gina Mazany was terrible. Continue. Carlo Pedersoli and Brad Scott made a fairly steady scrap which Pedersoli won. I like his kicking game and think he might stay in welterweight for a while. Molly McCann was a hometown fighter, but Gillian Robertson kept her quietly with a bit of a smooth grip. After a dominant first lap she came to Mount and brought McCann to sleep with a good choke. In the only Fight Pass fight Elias Theodorou survived a cut to control Trevor Smith and win a decision. Like many fights on this map, there was a lot of clinching work. Elias has now won four out of five and he's already in the leaderboard, so next he should get someone on the ladder.